The choice of professionals. 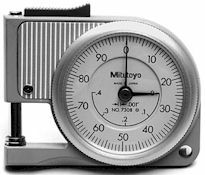 Aluminum casing and stainless steel gearing combine for a durable yet accurate tool for measuring paper, plastic, steel, or whatever flat surface you need. Each of the 100 graduations on this model is equal to .001". Each revolution of the pointer equals .100". Ideal for general use and easy to carry. Complete with padded carrying case. The range is .315" and the graduations are .001". The price of the 701 is $194.95. 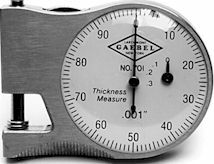 Perfect for measuring the thickness of paper, leather, wire, plastic sheet, and any other similar materials. Measuring faces are hardened, ground, and lapped. It has an adjustable zero point, fractions and decimal equivalents on the back, and a dull chrome-plated frame. Complete with fitted vinyl case. Dial is 1 1/2" diameter. The range is .375" and graduations are .001". The price of the 703 is $169.95. This fine quality tool is perfect for the professional who needs precision on the job. The frame precision cast, aluminum alloy contoured to fit comfortably in your hand. the dial has sharp, well-defined graduations for unmistakable direct readings through clear, unbreakable crystal. The spindle moves in very precise bearings so the flat, .250" diameter contacts maintain parallelism accuracy. Complete with padded carrying case. The 251 has inch increments, a range of .312", and graduations in .0005". 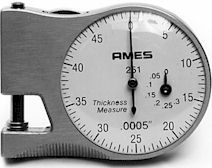 The 251M has metric increments, a range of 7.9mm and graduations in .01mm. The price of the 251 is $209.95, the 251M is $219.95. 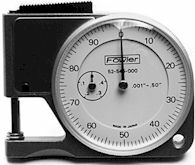 Made by Fowler, this is a handy tool for measuring paper, blankets, plates in the printing industry, or any other thin material. The frame is constructed of light, rust resistant aluminum. Measuring faces are hardened, ground, and lapped for accuracy. The 5450 has inch increments, a range of .500" and graduations in .001". The 5451 has metric increments, a range of 12.5mm and graduations in .01mm. The price of the 5450 is $139.95, the 5451 is $139.95.